SHOCK! JIHADIS TRY TO CONVERT THE KIDNAPPED INFIDEL IN THEIR MIDST…….. – The Tundra Tabloids……. SHOCK! 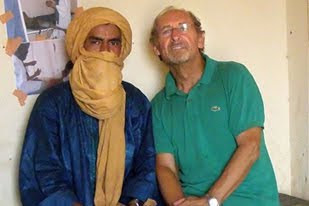 JIHADIS TRY TO CONVERT THE KIDNAPPED INFIDEL IN THEIR MIDST……..
VILLACOUBLAY AIR BASE, France (al-Reuters) – French aid worker Pierre Camatte, who returned to France on Thursday after being freed from captivity by North African al Qaeda militants, said his captors tried repeatedly to convert him to Islam. Camatte, who looked gaunt and tired on his arrival, was seized in November and held in the desert of Mali by men calling themselves al Qaeda “mujahedeen”, or fighters. Dressed in a white shirt and brown jacket that were too big for him after three months in captivity, Camatte said most of his kidnappers were under the age of 20. “It was a jail without bars, it was simply a roof,” he said. His captors would intimidate him by aiming rifles at him or miming throat-slitting, he said. Camatte was released in an apparent prisoner swap that has angered neighbours Algeria and Mauritania. Al Qaeda threatened to kill him unless four Islamist prisoners were released by February 22. All four were freed last week. “It’s not as if freeing four Salafi Islamists will change anything, given that in the meantime they probably recruited 40 more,” the former hostage said. Previous Post Previous Post NEW DUTIES FOR THE BRITISH POLICE: WATCHING OUT FOR RACIST BUS DRIVERS……. Next Post Next Post DANISH PAPER POLITIKEN BOWS TO INTIMIDATION…….